The dissident Chinese artist Ai Weiwei has announced that, “Chinese authorities in Beijing have demolished my studio”. 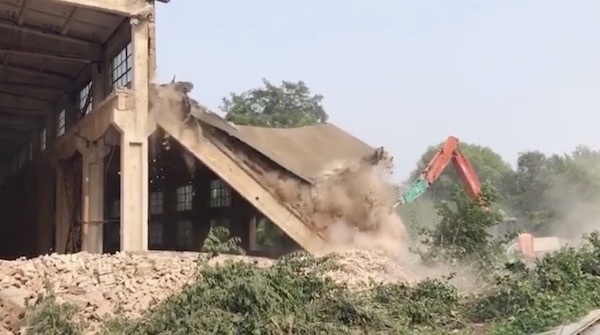 It was reported on his Instagram page, showing the former Brutalist factory being hit by a high impact drill. Mr Ai said that he had been given no notice of the decision. Another of his studios in Shanghai was destroyed in 2011. He also said at that time he had received no warning. On his return to China in 1993, Ai began to work in a direction that was both embedded in Chinese culture and reflected the exposure he had had to Western art during his twelve-year sojourn in the US. Citing Duchamp as ‘the most, if not the only, influential figure’ in his art practice, Ai continues to engage with creative tensions between complex art histories, conceiving works with multiple readings in the process. To this end, he employs traditional materials and interventions with historical objects throughout his work from Neolithic vases (5000-3000 BCE) to the Qing dynasty (1644-1911) architectural components and furniture. By creating new objects from old, Ai challenges conventions of value and authenticity in modern-day China. These artworks include Table and Pillar, 2002, from his Furniture series, and Coloured Vases, 2015. Ai works in a variety of different contexts, scales and media. He transforms materials to convey his ideas, whether in wood, porcelain, marble or jade, testing the skills of the craftsmen working to his brief in the process. Some pieces take months to create and pass through lengthy periods of experimentation, pushing the boundaries of the formal qualities of a material. Sculptures such as Surveillance Camera, 2010 and Video Camera, 2010, both masterpieces in craftsmanship, monumentalise the technology used to monitor, simultaneously rendering it useless and absurd. A new artwork, Remains, 2015, will also be included in the exhibition. Fabricated in porcelain, the work replicates in meticulous detail a group of bones that were recently excavated at a site of a labour camp that operated under Chairman Mao in the 1950s. The 66-year-old has more recently lived in Germany after leaving China in 2015, following his arrest and internment. He is a staunch critic of China’s government. One of Ai’s assistants, Gang Ra, told the AFP news agency that the rental contract for the building had ended last year but that it “simply wasn’t possible” to move out at the time because of the number of works still present. He said that they had been told that the move would need to take place within a matter of days, but added that they had not been warned when the demolition would begin. The son of one of China’s most famous poets, Ai designed Beijing’s ‘Bird’s Nest’ stadium for the 2008 Olympics but has since become an outspoken critic of the Chinese government. He was arrested for several months in 2011 and had his passport confiscated. He then moved to Berlin in 2015.